Today is the first day of summer, so I have a story to tell you. I do not have the exact date, but twenty years ago this summer I bought a new desktop computer. It came with a screaming fast 9600-baud modem and free America Online software already installed. I went online for the first time. I was delighted to find that America Online had a genealogy forum. I started participating in the groups and chats there and exploring the file libraries. I recall being intrigued by this thing that existed outside of AOL. It was called the Internet. I bought a book that explained exactly what that was, how it worked, and about the history behind it. I like to know how things work and what makes them tick. This helps me to understand how to make the best use of them. I started exploring the Internet and figuring out how and where to find information that helped my genealogical research. I have been a genealogist since doing a high school project in 1980. Mr. Esau's class, Contemporary World Problems, included a project to learn about our family history and demonstrate our ethnic diversity. I received an A on that and still have the posterboard with his comments. The year I was born my maternal grandmother, Ruth LaVern (Johnson) Nash, had purchased red vinyl family tree books for herself and her four children. She filled hers out so well that in 1980 I had a firm start on my Mom's side of the family. That same year my Aunt Daisy traveled back to Indiana and Virginia to gather family information for my Dad's side of the family. This was the foundation for my future research. I had been working with computers since the mid-1980s. My job at Puget Sound Bank included working with an IBM DOS-based computer and being responsible for an NCR system in our department. I taught others how to use it and wrote the procedures manuals too. My Dad got a new computer in about 1988. He purchased the first version of Family Tree Maker for DOS for me. I went to his house every day for several weeks in order to enter all my genealogy information into the database. So, several years of computers and genealogy were about to collide as I went online in the summer of 1995. As I explored online I learned how to make "favorites" in AOL. Netscape Navigator called them "bookmarks." 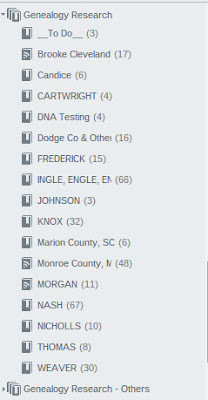 I started bookmarking everything I could for genealogy. I joined the popular ROOTS-L mailing list and starting talking with others around the world about my favorite thing, genealogy. I have often thought about how the Internet opened up my genealogical world. I live in Washington state. Prior to the Internet my research was done in a vacuum that existed in the northwest corner of the United States. I didn't have the money to travel and do research in the midwest and the east where my ancestors had lived. All of my research was done by mail, at the library, at the National Archives branch in Seattle, and with microfilm at the local Family History Center. I joined the local genealogical group, the Tacoma-Pierce County Genealogical Society, and became an active member of the board. I attended my first national conference, the Federation of Genealogical Societies annual conference, in Seattle in late summer of 1995. My genealogical window was opened wide. During the summer months the TPCGS group doesn't hold monthly meetings. In September we get back together and do a show-and-tell of what we did over the summer. I remember that meeting in 1995 very well. Nan came and brought a quilt she had made over the summer. The squares had old family portraits and photos that she had printed and ironed onto the fabric. Others told about genealogical vacations they had taken, visiting courthouses and cemeteries and all their discoveries. I had decided to share my list of bookmarks. I had printed it out on one whole page. I wasn't sure if anyone would care about this Internet thing. Computer owners were in the minority at the time and even they weren't all online. I made ten copies of my bookmark list in case anyone else was interested. They were. In fact, they were all so interested in it that I had to run upstairs to make more copies. That's when Cyndi's List was born. It's all Nancy Peterson's fault. She was the editor of the TPCGS quarterly. She came right up to me at the meeting and asked if I could turn my one-page list into an article for the quarterly. Maybe five or six pages long. I said I could, but I would have to categorize the bookmarks. That's when that started. 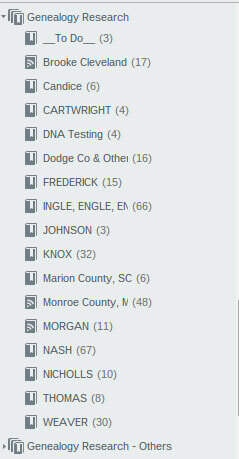 I scoured the Internet for all-things genealogy. I found topics and ethnic groups and locations that I knew nothing about, but I figured others would find them useful. The article was published in the late fall of 1995. I need to find a copy of that article for my archives. I didn't keep a copy that I can find. And I had no way of knowing what it would become. In January of 1996 I decided to create my own personal web site. I taught myself HTML and created a very basic, very rudimentary site. I included articles that I had written. So, I figured the list of bookmarks from that article might be useful if I put it on the site and made them into clickable hyperlinks. It was one web page with 1,025 links. I titled the page, "Cyndi's List of Genealogy Sites on the Internet," which was long and cumbersome, but explained exactly what it was. I now think it was a silly name, but it worked then. I told other genealogists on ROOTS-L about my personal web site and the list of links that I had included. I was immediately swamped with emails from people asking if I would add a link to their genealogy site. I did. And that is how it grew and grew and grew. In honor of the past twenty years of my life dedicated to this site, I have decided to blog here about Cyndi's List. About its history, its growth, its popularity, how to use the site, and what it takes to maintain the site. It is hard to imagine that two decades have passed and Cyndi's List is still growing and evolving and is still incredibly useful to millions of people worldwide. And it is still free for everyone to use. There has been a lot of blood, sweat, and tears that I've put into the site. And a lot of my own money too. It has been both a blessing and huge job for me alone. I upgraded the site in 2011 at a cost of $40,900.00. Over the past few years I have incurred another $20,000+ in administrative expenses. When I upgraded the site I added a PayPal Donation button. It was one of the hardest things for me to do. I do not like to ask for help. My friends and colleagues tell me that I need to do this. So, here it is. To date about 74% of the upgrade expense has been reimbursed through donations by all of you kind people. This means that there is still about $30,000 outstanding including the upgrade expense and the administrative expenses. I do appreciate all the thoughtfulness and help that I've received to date. Genealogists are a wonderful group of sharing and giving people. I am thankful. Regardless, Cyndi's List will continue to grow and I will continue to maintain it. I hope you all find it a helpful research tool online. TIP: Pick one system that works for you. Then duplicate that across all of your research areas: paper files, paper notebooks, computer files, cloud files, research notebooks, bookmarks for research, e-mail, etc. If you use the same filing system in each function you will have an easier time finding what you need. You can have up to 250 notebooks within Evernote. Notebooks can be stacked one level deep under a top level. So, my personal set-up has a stack for Genealogy Research and under that I have one notebook for each surname I work on and one notebook for some of those localities in which I am doing a lot of research on several families. I have stacks for my other genealogy activities: Genealogy Business, Genealogy Conferences & Travel, Genealogy Education - Me, Genealogy Lectures & Speaking, Genealogy Research - Others, Genealogy Volunteer Stuff. I also have stacks and notebooks for non-genealogy stuff (when do I have time?) including Cyndi, Evan (my son), Mom (mine), Household, Recipes, Receipts, etc. The screenshots below show my stacks and notebooks. The screenshot on the right shows all of the notebooks currently under the Genealogy Research stack. Copyright © 2014 Cyndi Ingle. All Rights Reserved. The first thing you should do after installing Evernote on every one of your devices is to install the Evernote Webclipper in your web browser: http://evernote.com/webclipper/. The webclipper appears as a small Evernote elephant button on your toolbar. Upon visiting a web site you can clip information from a site directly into your Evernote notes. The clipper launches a menu that gives you the option to clip an entire article which the clipper tries to identify as the main text on the site, a simplified article without ads and extraneous graphics, a full page that includes everything, a bookmark only, or a screenshot of what appears on your screen at that moment. Choose which option you like and save it. You also have an option to share a clip with a link, by Facebook, Twitter or e-mail. Prior to saving the clip you can also choose the notebook in which you want to file the note and you can add appropriate tags. The newest versions of the webclipper also include markup options that allow you to add notations. You can markup with a highlighter, a marker, stamps, text, arrows, a pixelated blurring tool, and a cropping tool to resize the clip. For genealogy the webclipper means clipping a source for your research. As you research online you will run across bits of text, entire articles, images of records, or web sites that you might want to bookmark and revisit. Clip these things into the appropriate notebook in Evernote and you can refer to them any time you need to, from any of your devices with Evernote installed. As you clip Evernote automatically tracks the date you made the clip, the last date you modified the clip, and the original URL from which you obtained the clip. Yes, people. There is a life outside of genealogy. I think. Following are the ways I use Evernote outside of genealogy. One for me and for each of my other family members - my mom, my son, and my pets. I use them for a lot of things. I keep health-related articles and lists, book series I'm reading, and other personal lists. I keep track of my mother's computer stuff like which inkjet cartridge to buy for her. I keep track of my son's school stuff including upcoming college and scholarship applications. I have a copy of the user's guide for his new electric razor so that I always know what replacement blade to buy him and when to remind him to change it. One for the Household. This one includes household maintenance to-do lists, reference material about household maintenance, a timeline of what household repairs I've done and how much they cost, holiday planning and lists, PDF copies of household product manuals (instead of keeping all those papers and books), and much more. Most useful recently: a chart I found online that told me which of the new light bulbs to buy that match an old 60w lamp. One for Travel. Notes inside have packing lists, e-mails with flight information, itineraries, sight-seeing info, hotel confirmations, etc. One for Computers. This one holds articles, tips and tricks I've run across, a list of my computers and hardware along with model numbers and serial numbers, ink jet cartridge numbers, etc. A notebook for your garden to keep track of planting dates, fertilizing dates, seeds/plants used, etc. It brings in recipes you have clipped into Evernote and supplies some more on top of that. For handwritten notes with your tablet and a good stylus. https://evernote.com/skitch/For marking and annotating on images. For jotting down quick notes without launching Evernote first. The notes are synced with Evernote. For example, I've used it to quickly write notes from a voicemail message or a phone call. http://appcenter.evernote.com/app/scanbot/iphoneFor high quality scans using my iPhone that automatically sync to Evernote. 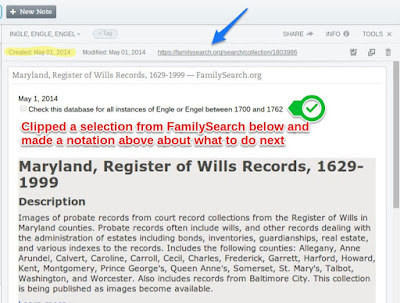 Here are a variety of tips and ideas for helping to make Evernote easier to use and to make it a great genealogical research tool. Create an entry in your e-mail contacts/address book for your Evernote e-mail address. This makes it that much quicker to forward important messages from your e-mail to Evernote. Setting up notebooks and choosing option settings both tend to be much easier from the desktop version than from the web or other devices. So, I do all my setup and administration on the desktop. Be aware that the different versions of Evernote all have the same basic functionality, but they may behave different from one another based on the operating systems: desktop, iOS, Android, and web-based. Create Shortcuts to specific notebooks that you use more often than others. These get put at the top of the list on the left, so they are easier to get to. Right-click on the notebook and add the shortcut. Create a notebook named "_Inbox" with the underscore up front to guarantee that this notebook will be listed at the top. Make _Inbox your default notebook. Then all notes that are e-mailed to Evernote or clipped to Evernote without being filed or tagged will show up in the _Inbox for you to properly administer later. In the web version, right-click on the notebook and choose "Properties" and then "Make this my default notebook." In the desktop version, right click on the notebook, choose "Notebook Settings" and then "Make this my default notebook." File and tag notes as they come in. Don't let them pile up the way you let all that paper pile up on your desk. Yes, I know what your desk looks like. 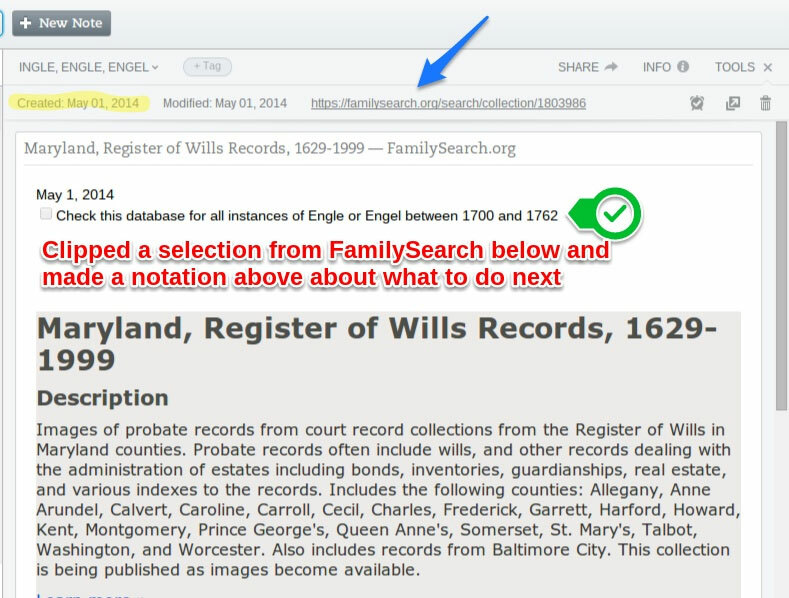 Create notes with pre-written queries or replies about specific ancestors. Store them in each surname notebook. The pre-written text can easily be copied and pasted when participating in e-mail, mailing lists, message boards, or social networking. Create a notebook for your Unidentified Photos. Inside that, notes for each photo. The notebook and/or notes can be shared publicly in social networking forums to gain help identifying the people in the photo. Within each surname or one-place study notebook, create a Table of Contents note that points to all of the other notes within. A TOC can be created in the web version by right-clicking on a note, choosing Copy Note Link, then pasting the link into a new, blank TOC note, one at a time. In the Evernote desktop versions you can select a whole batch of notes and then right click and create the TOC all at once. Obviously, this is easier and preferable. The TOC list can also contain checkboxes so that it can be used as a to-do list if you like. Create a "To Do" note in each surname or place name notebook. Use the checkboxes to keep track of which items you complete. The To Do list for each notebook will be different depending on where you are with your research. You can copy and paste from web sites or other documents into Evernote, but the formatting will always come with it. To paste as plain text and remove formatting use Ctrl+Shift+V. A regular paste is Ctrl+V. There is also an "eraser" icon on the formatting toolbar that will remove formatting after the fact. For those of you who publish your own web sites, Evernote can be used to store snippets of code and other notes pertaining to maintaining your site. Bloggers can use it to plan their blog posts. Your Evernote account provided you with an Evernote email address. So, why do you want or need an Evernote email address? Particularly for genealogy? It brings them into the same filing space as your other research notes and documents. It makes them searchable along with the other research notes and documents. Yes, often your email is searchable within the email program. But putting it into Evernote means you do one search across all of your research notes and emails at the same time. When you receive an email query from a potential cousin, forward a copy to your Evernote address to be filed in your notebooks and saved for future reference. When you write a research email include your Evernote address as one of the recipients. A copy of your message will be saved in your notebooks for future reference. Create a notebook for travel. When planning a research trip you may receive e-mail confirmations from airlines, hotels, and conferences or seminars. Forward confirmations to your Evernote account and keep them in a Travel notebook so that they are easily accessible through the app on your tablet or smart phone while you're at an airport, at the hotel, or in a shuttle or taxi. Better yet, instead of forwarding them, use your Evernote e-mail address when registering and the original confirmation will go straight to your Evernote. No more print-outs for your trips. Put all relevant travel info into one notebook and they go with you everywhere you go. For example: airlines confirmation, hotel confirmation, seminar registration, weather information clipped from the web, travel checklist, packing checklist, tourist info, maps, and anything else you would normally print and take with you. Create a notebook for your genealogy software program. Bring all of your genealogy software info into one filing space in Evernote. Include clippings from the web about how to use the software, and hints or tips. Forward email newsletters to Evernote when they contain hints or tips that you want to keep and refer to later. Forward email confirmations when you purchase programs or upgrades. Forward any email correspondence you have with tech support when dealing with specific issues. Create a notebook for your DNA research. Bring all of your DNA research into one filing space in Evernote. When testing multiple family members and/or multiple DNA companies, create a master note with a table that includes the DNA company information, names of people tested, kit numbers, passwords, etc. Forward email confirmations to Evernote when you purchase kits. These usually include registration or login information. Forward email notifications that tell you that you have matches or new people to contact. Create a notebook for your genealogical and historical society membership(s). Create a master note with a table that includes a list of all your societies, your membership numbers, etc. Forward email confirmations to Evernote that include your membership information with expiration dates. Forward email newsletters that have information that you might want to refer to later. Set an Evernote reminder on the note to remind you when it is time to renew your membership. One of the powers behind Evernote is the search function. And tags for notes make that search even more powerful. Think of tags this way: they function just as tabs do in your physical notebooks. They help to sub-divide, thus sort, the contents within a notebook. You can create up to 10,000 different tags. You can have up to 100 tags per note, but that is overkill. I suggest you give notes at least once relevant tag. Two or three should do it in most cases. For example, within my INGLE, ENGLE, ENGEL notebook I have tags for David Henry Ingle, Adam Monroe Ingle, Mathias Engel, etc. These are my 1st, 2nd, and 3rd great grandfathers. I then tag notes for anyone who is a descendant of these people. This can be used if you want to tag each individual person in a family group. However, I wouldn't do this for all people in your research. You have a total limit of 10,000 tags. I would only create tags for individuals that have a high profile in your research. Because a notebook will be for the husband's surname, tagging a maiden name of a wife helps you sort. For example: Deed, Census, Will, Taxes, Military, Pension, Map, County History, etc. For example, specific archives, libraries, or web sites used for the research contained within the note. I have notes tagged "FHL" for the Family History Library or "ACPL" for the Allen County Public Library. 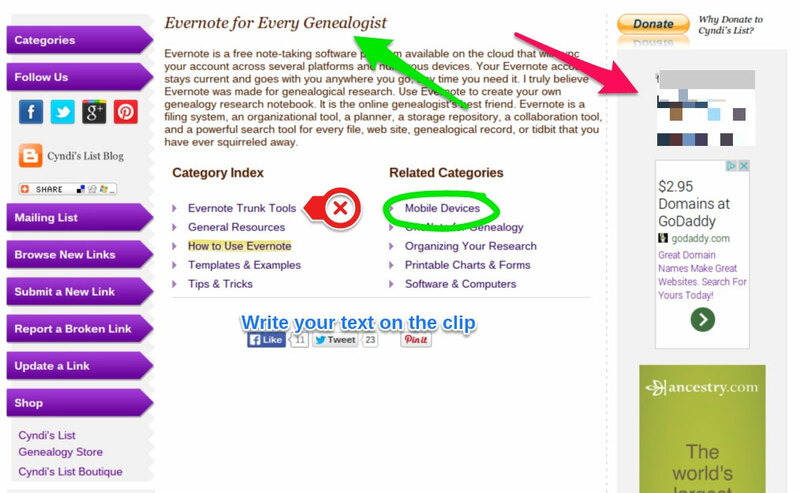 In the first post I described what Evernote is and what types of notes we might create for genealogy. What I didn't say in that first post requires a post of its own. If you aren't already keeping a research plan and research log in some sort of research workbook (physical or virtual), it is time to do so. And the research workbook is why Evernote was made for genealogy. I became a genealogist in 1980 because of a high school project, a family tree book filled out by my maternal grandmother, and a trip taken by my Aunt Daisy to visit all the relatives in Indiana and Virginia. My first research notes were copies of family group sheets and pedigree charts that she had filled out and had made copies for me. As she started talking about the people she met I made notes in the margins and on the backs of the papers. As I moved on in my genealogical learning process I started my own 3-ring binders for each surname to store those sheets and to insert new pages with notes and documents. When I finally had space for large filing cabinets I was able to keep everything in hanging files and folders instead of the binders. When I started to visit libraries and archives, and when I went on a trip to visit extended family, I began to use individual steno notepads for each surname I was researching. By 1988 my Dad had purchased a computer and a copy of the first version of Family Tree Maker for DOS for me to use. I went to his house to load all of my family information into the software. By the time I got my own computer I moved my database over and started keeping my research notes in Word documents. As I upgraded through new versions of FTM and then on to Generations, The Master Genealogist, and RootsMagic, I also kept research notes in the miscellaneous or notes fields within the software. Several years ago I purchased a copy of MS Office Student which included OneNote, a program similar to Evernote. So, I played with it for research notes as well. For the last 5 years I have been extensively using Evernote as my genealogy research notebook. That recap tells you that I've done exactly what most of you have done. In 34 years I've accumulated: paper, forms, photocopies, tablets, documents, post-it notes, letters, scraps of papers, envelopes, photos, conference/seminar notes, business cards, flyers, pamphlets, and numerous electronic notes and digital files stored on hard drives, CDs, flash drives, and on the cloud. Everything I need for my research is scattered across more than 3 decades of genealogical educational growth and technological advances. I need to bring everything into one place, cull out the stuff I no longer need, and better organize the stuff I need to keep. Computers and software should make our research easier. This is where Evernote works for me. I can scan all those scraps of paper and place them in Evernote. The scraps are now all in one place and they all become searchable. I can keep research notes in folders by surname, just as I did with tablets and notebooks. But now those notes are searchable across all notebooks at one time. So, wherever there is a person that appears in more than one family the search will find them. I can have more than one type of media contained in one research note. For example: a selection of a web page clipped into a note, marked up with Evernote webclipper tools, and typed notes above/below that clipping that explain why I made the clip, what I intend to do with the clip, and how it applies to whatever I'm doing. Another example: an image and a PDF file can be stored in the same note together, along with typed notes or handwritten markup in the note. I could have a scanned image of an obituary and I can add personal notations and transcribe that obituary in the same note. This would be helpful whenever the scan of the image isn't the best quality. Here's an example of a U.S. census record found on Ancestry.com. I clipped the text from the search results on the site into a note. Then I clipped the original census image into the same note: http://goo.gl/i7tP94. In the old days we might have printed a page with each and put them together into a sleeve protector in a notebook. Now they are in digital format and searchable. Having my seminar notes in Evernote along with my research notes means that I find new resources to use in my research. For example, if I do a search on Virginia or Indiana or Dodge County, Wisconsin up pops my research notes for ancestors from those areas along with those notes I took at a recent genealogy conference about how to do research in those areas. Having my research notes all in Evernote means I can access them anytime and anywhere. I don't have to lug that heavy notebook or multiple tablets with me anymore. And how practical is it to haul around a large 4-drawer filing cabinet with you? I have my notes with me on my phone, my iPad, my Chromebook, and my laptop. And because Evernote is also available on the web I can access it from any library and even when I'm visiting a friend's house. Recently, while giving my lecture on using Evernote I talked about all of the above. A gentleman in the audience asked me why I would bother keeping all of this information in Evernote. Why not just put it all in my genealogy software program? First, we gather data from numerous sources. We may need to evaluate all of those sources and come to a decision about the evidence contained within. That can take time. I don't enter anything into my genealogy database until I'm comfortable with the data and the research and reasoning behind using it. Also, the Notes or Miscellaneous fields in genealogy software programs generally have a size limit. You may not be able to add large chunks of text or attached files, depending on the program. Therefore, Evernote holds all my research notes, while the database holds my research conclusions with source citations. Both the free version and the premium version have unlimited storage. So all of your notes and files can be stored within--eventually. During initial setup you might bring in notes slowly to accommodate the monthly upload allowance. If you store files on a cloud service such as Dropbox, Amazon Cloud Drive, Google Drive, or Microsoft SkyDrive, you can set up links to those files within a note in Evernote. You are making a table of contents via links/bookmarks to your cloud files. You could even do these in individual notes within each of the surname notebooks. Doing this means you still bring your research focus into Evernote and individuals files can be moved into or copied into Evernote later.